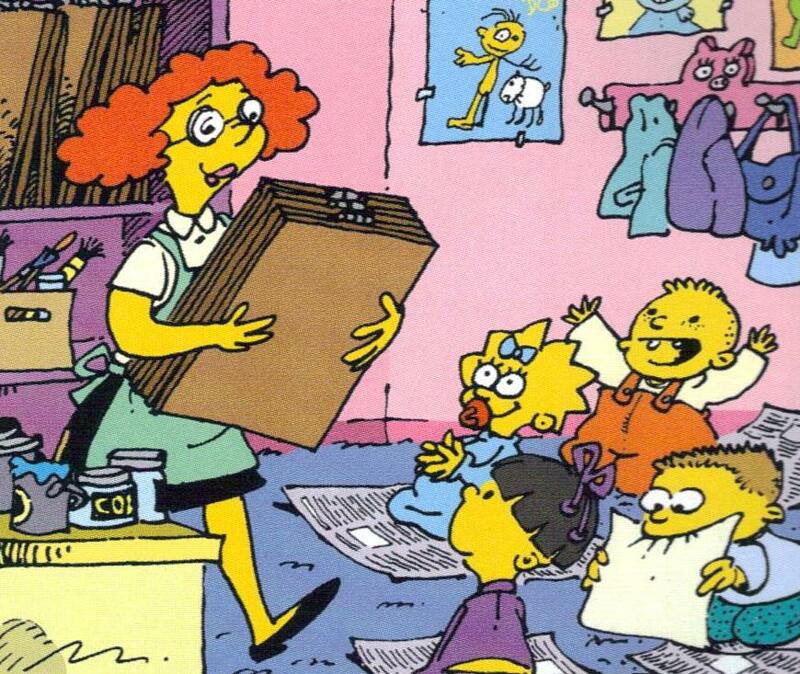 The Day care teacher (name not known) is a woman who works at the Day Care Center in Springfield. The day care teacher seems to be friendly and outgoing, and gets along well with both children and their parents. The parents are happy leaving their children with her, and she has a knack for getting the attention and respect of the children. Even Maggie goes out of her way to please her. When Marge left Maggie at the Day Care Center, painting was the day's activity. The teacher set the children up with easels, papers and paints. Maggie quickly prouced a masterful painting of a vase full of flowers, but then became concerned when she saw that the other children had either done crude drawings or simply smeared their paints on their papers. Maggie then smeared her own paints around, turning her painting into a random assortment of green and yellow smears. When the children were all done with their paintings, the teacher smiled and applauded their work, and the children (including Maggie) smiled back, some of them also holding their paintings up to her. Modified on January 5, 2013, at 10:58.